Office space in Cardiff provided by Connies of Cardiff Ltd. Connies was formed in 1926 and is a family run business. Connies provide office space, both furnished and unfurnished, for businesses in Cardiff. We have been on our present site since 1940. Connies House is situated off Newport Road at the bottom of Rumney Hill, half a mile from A48 (M4 link) and 2 miles from the City Centre. Buses serving Rumney, St Mellons and Newport from the City Centre stop 200 yards from the office and are approximately every 7 minutes. Since 1986 we have offered a variety of single and multiple office units for rent. The office space is refurbished at regular intervals and appeal to tenants seeking a completely private office available 24 hours and seven days a week. Single offices range in size from 140sq ft to 400sq ft and double and triple office units are also available. Rent, including services start from £150.00 per month plus VAT. Services include heating, lighting, cleaning of general areas, on site parking and building insurance. 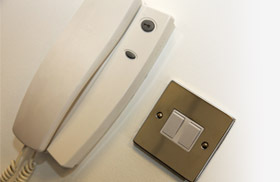 All offices have ample power points, phone sockets and internet facility. Our reception office is open from 9.30am daily and in addition to receipt and distribution of tenant's mail, offers fax and photocopying facilities if required. We will also accept delivery of small parcels if tenants are out of their office.